Apartment in Palermo Hollywood, Buenos Aires - Zen Loft ! 650 square feet duplex apartment in Las Cañitas, on one of the coolest strips of BA, close to restaurants, bars and Polo fields features amazing private terrace and rooftop pool and barbeque. 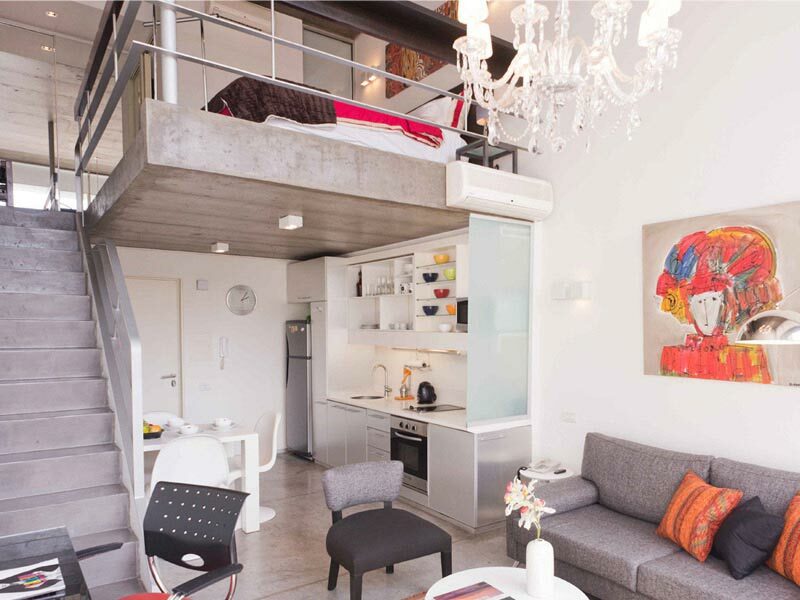 Zen Loft is located on one of the trendiest strips of Buenos Aires, close to great restaurants and bars, and major transport links. This apartment for rent in Buenos Aires comes fully equipped with everything you might need, and a bit more. On the ground floor you will find the open plan kitchen and the living area, featuring a 32’’ screen TV with Cable, comfortable seating space and providing access to the amazing private terrace, complete with loungers, table and chairs. The floor to ceiling windows make this loft a light filled room from dawn to dusk. The bedroom, with a queen sized bed, is located on the mezzanine level, along with the well appointed bathroom. Across the bedroom you will find a small office area and two bunk beds that provide extra sleeping space. This building comes complete with a rooftop pool and communal barbeque area. There is no doubt that your stay at this loft will make for an unforgettable Argentine experience.